There is nothing worse than trying to sleep in a sticky, hot, humid room in the summer. The solution? 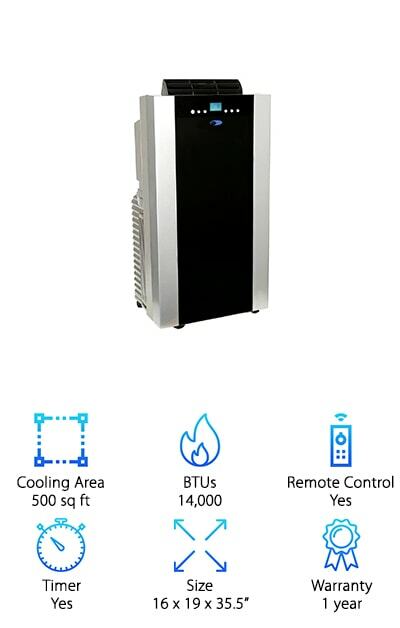 A quiet portable air conditioner. Whether you put it in your bedroom, living room, or anywhere else you want to stay cool, a unit that’s quiet is generally preferred to one that you can’t hear yourself think over. We put together this portable air conditioner buying guide to help you find the right one. Let’s look at some key features. Cooling Area: This is how many square feet the unit can cool. It’s best to match this as accurately as you can to the room where you’re planning to use it. Too much or too little isn’t good. BTUs: The more BTUs you have, the more powerful your AC is. Or, you can think about it like this. The more BTUs you have, the larger the space you’ll be able to cool. Easy, peasey. Remote Control: Okay, so a remote isn’t necessarily going to make your AC work any better. But it will help you stay more comfortable, especially if you need to make adjustments in the middle of the night. Timer: A timer is great for 2 reasons. First, the AC can automatically cool your room for you so it’s ready when you get home. And second, it can turn it off so you don’t leave the unit running while you’re out. Size: Typically, larger units have more BTUs and can cool more square feet. This is just a general rule, though. Consider your floor space, too. Don’t get one that will make the room too cramped or cluttered. Warranty: Some of these have straightforward warranties while other cover the unit and the compressor for different lengths of time. We noted the different timeframes in the reviews when possible. We’ve covered some of the main features of one of the most quiet portable air conditioner, now let’s move right into our reviews. If you’re in a hurry, make sure you read about our top and budget picks. They’re the first 2 items on the list and give you a great idea of what’s available. Stick around if you can, though, these are all high-quality products that you won’t want to miss. Alright, let’s get right to it, cool? Cool. 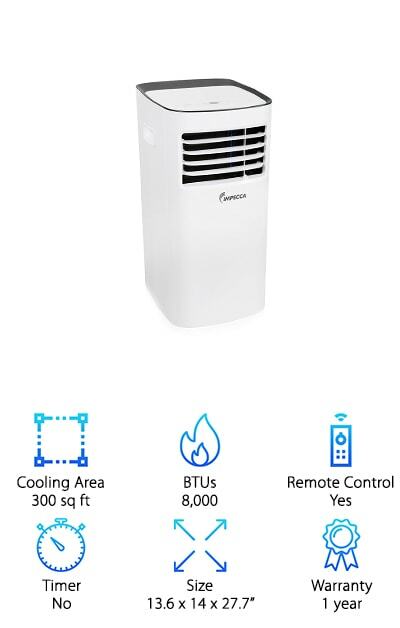 The best quiet portable air conditioner we came across in our research is the Emerson Quiet Kool AC. One thing that we really like about it is the 24-hour timer. You can preset when it turns both on and off. So, you can come home to a cool bedroom at the end of a long day. Plus, you won’t have to worry about whether you left it running all day while you were at work. Plus, it comes with a window venting kit for easy installation. And get this: it can even act as a dehumidifier because it pulls unwanted moisture from the air. The warranty is pretty great, too: 1 year labor, 2 years for parts, and 5 years for the compressor. If you’re looking for a cheap air conditioner, check out our budget pick. 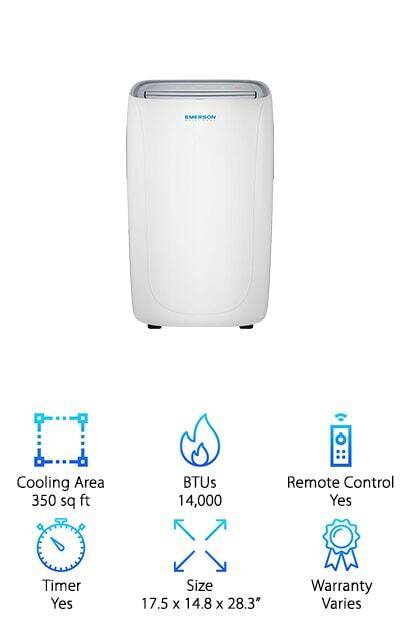 This Black+Decker air conditioner is designed so the air is in constant vertical motion which helps keep the air temperature more consistent throughout the room. The LED digital display makes setting the timer and adjusting the temperature really easy. 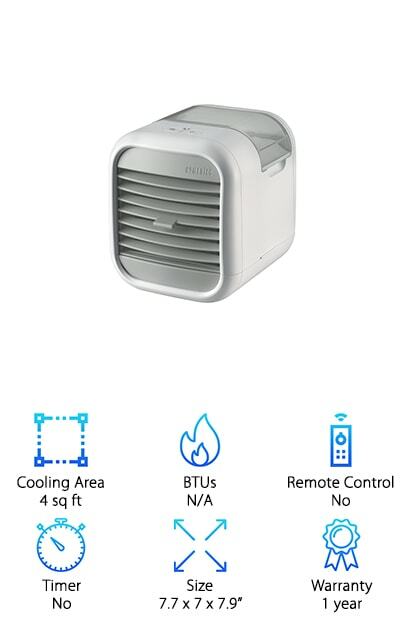 If you live in a climate that gets humid in the summer, you’re going to love this: it has a dehumidification mode to help you get even more comfortable. Installation is easy because the window kit is included. There are also rolling castors and side carrying handles that make it really easy to maneuver. And maintenance is no sweat - just slide out the filter and give it a rinse under the faucet. 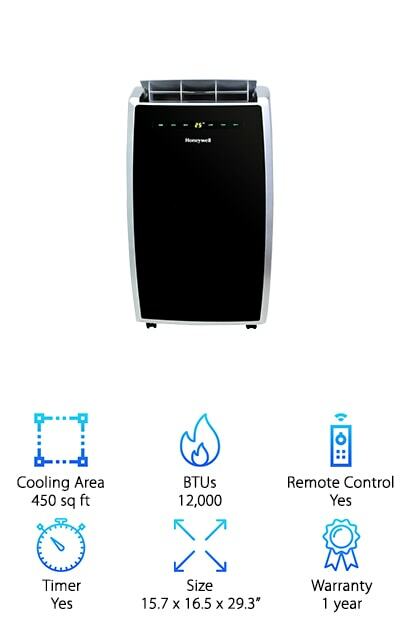 For anyone looking for the best air conditioner brand, you can’t go wrong with Honeywell. 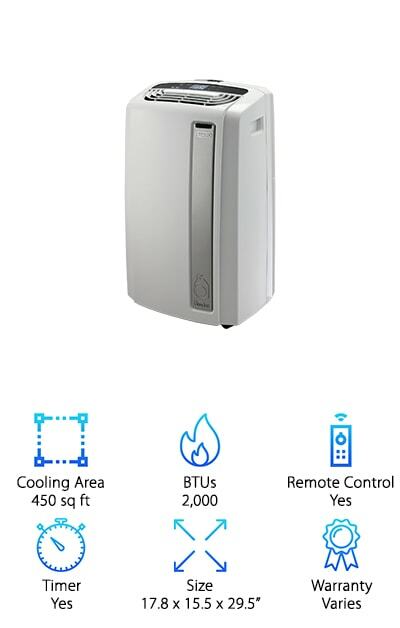 This air conditioner can not only cool areas of up to 450 square feet, it also acts as a dehumidifier. If you live in a humid climate, you know that humidity makes warm temperatures even worse so this is a really awesome feature. Not only does this AC have an easy to use LED display, it also comes with a remote control that lets you adjust everything. If you wake up in the night and need to adjust the temperature, you can easily do so without even having to get out of bed. It has 3 speeds to choose from, too, so you can fine tune it to get exactly the temperature you want. The Whynter Portable Air conditioner is our next pick in our hunt for the quietest portable air conditioner. Here’s what we love about it. It’s powerful. In fact, it’s one of the most powerful ACs we found in our research and is even tied with our top pick. It cools up to 500 square feet and also acts as a fan and a dehumidifier. That’s not all, the window kit and intake hose are included to help make installation as easy as possible. The castors help make positioning the unit really easy. The remote control and 24 hour timer are super convenient and we really like the easy-to-clean pre-filter. With 3 different fan settings and temps from 61 to 89 degrees F, you’ll definitely be able to get your room just right. The DeLonghi America Air Conditioner is a perfect size. It’s not the biggest unit we reviewed and it’s not the smallest… it’s just right. 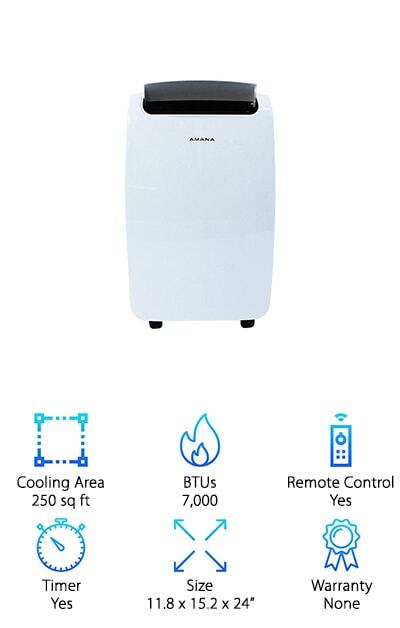 Plus, with its Whisper Cool Mode setting, it is one of the most quiet portable air conditioner. That makes it a great choice for sleeping or watching TV because it won’t be a distraction. The 3-in-1 operation is ideal. It cools, dehumidifies, and can be used as a fan. That’s not all. Installation is easy, too, and the durable castor wheels make it really easy to move around. And guess what else? It has a 24 hour digital timer and a fully functional remote control. One last thing, the warranty on the whole unit is for 2 years but the compressor is covered for 5. 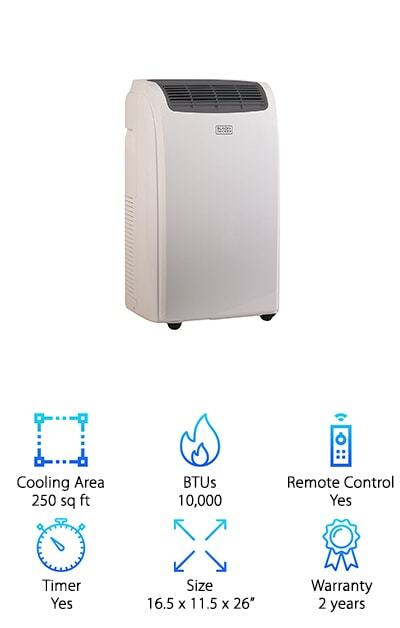 One of the things we like most about the Ivation Portable Air Conditioner is its size. It’s narrower than most of the other products we researched which means it takes up less room on the floor. The installation kit is included and lets you install it in either sliding or double hung windows. There’s a lot of presets with this one, too, so it’s really versatile. You can choose from cool, fan, dry, auto, and sleep mode. Auto mode turns the unit off when the room hits a pre-set temperature, which is really convenient, especially at night. There are 3 different fans speeds, too. Adjust as needed and save yourself some money on your energy bill. The LED display and remote are both easy to use. Making adjustments is really simple. If you’re looking for a small quiet portable air conditioner to help you cool down at your desk, check out this HoMedics MyChill Cooler. This is a brilliant design that basically acts like your own personal air conditioner. You can use it in any room, regardless if there’s a window or not. Plus, it’s less expensive to run than a larger unit. It makes a concentrated stream of cold air that can lower the temperature around you by up to 12 degrees. The 4-foot cooling area is perfect for cubicles, desks, dorm rooms, and more. There are 2 fan speeds and it lets you know when it needs more water or cooling media with simple indicator lights. This is basically the cooling version of a space heater, perfect for hot summer months. If you’re looking for an air conditioner that’s perfect for cooling down a small room, look no further than the LG Portable Air Conditioner. This one cools 150 square feet and is the perfect size for a bedroom. It even comes with a remote control so you can make adjustments without even having to get out of bed. The timer comes in handy, too. Set it to come on right before you get home so the room is cool when you get there. This one also acts as a dehumidifier which will make the room that much more comfortable. We like the look of this one, too. It’s not easy to hide a portable air conditioner but this all white design blends in instead of drawing attention to itself. The Amana Portable Air Conditioner can cool a room up to 250 square feet. Thanks to the easy-rolling castor wheels, it’s really easy to move it from place to place and get it into the proper position by the window for installation. One of the best things about this one is the timer. Cool your room on your schedule. Seriously, there is nothing nicer than arriving home to a nice, cool bedroom at the end of a long summer day. This one is a dehumidifier, too, which we can’t say enough good things about. There are 2 fan speeds to choose from and a remote control that makes adjusting the unit incredibly easy. One more thing. To make it really easy, this one comes with the installation kit included. Last up in our quiet portable air conditioner reviews is the Impecca Portable Air Conditioner. This unit is the perfect size because it’s not too big and not too small. It also has a pretty basic, minimalist design. The all-white surface will easily blend in with your decor. 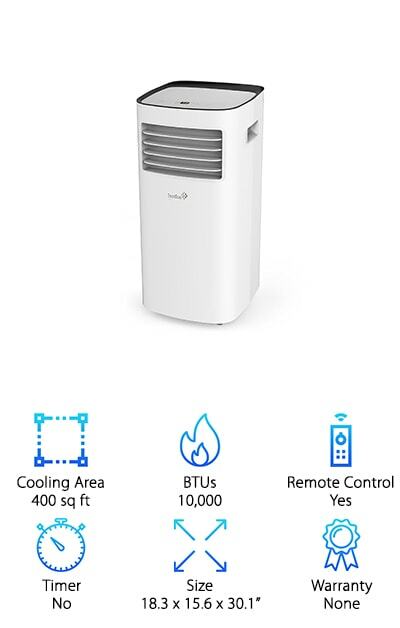 This one has 3 different modes: dehumidifying, fan, and cooling mode. 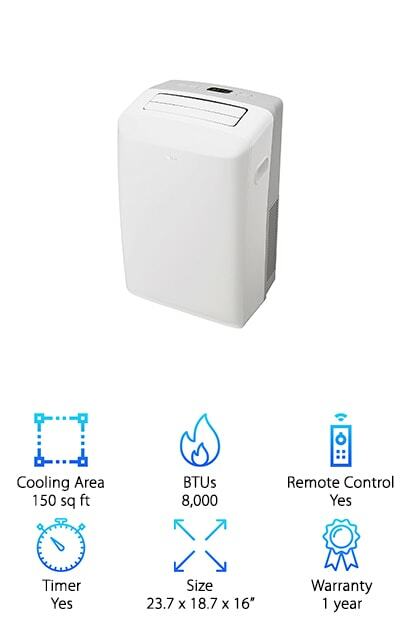 The included remote control makes it really easy for you to change the temperature and cycle through the 3 different fans speeds no matter where you are in the room. And here’s the best part. Thanks to the whisper quiet operation, you can stay cool into summer and go about your life without having to talk or watch TV over a loud air conditioner fan.